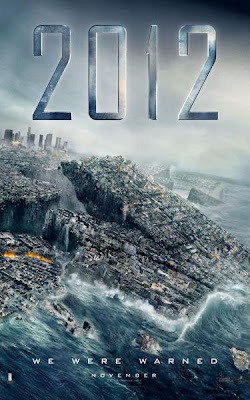 Well, most have heard the story of how Nostradamus predicts that the world will end in 2012. So it was only natural for Hollywood to createit's own version of what will happen on that fateful day. The result: big, dumb, popcorn fun, 2012 (2009). Of course, the movie centres arounf the day the world is to end. During that day there are a few different stories, but the most prominent is about a writer named Jackson Curtis (John Cusack). He decides to take his kids away on a camping trip to Yellowstone National Park, only to find that something is going down, something large scale. I thought 2012 was going to be pretty bad, simply because it was made just to scare everyone about something which may/may not happen. However, I was pleasantly surprised. The movie starts off with a bang, but gradually gets boring, until it picks up speed again towards the end. One major problem I had was that the movie was just under two and a half hours, half an hour of which could have easily been cut out. But this is a visually stunning film: seeing most of America slide down under water was a pretty amazing experience. 2012 is quite a good action film, even if it has one of the most unlikely heroes in it: John Cusack. I can't say everyone will like it; it is very long and feels it's running time. I also think it makes this day look pretty fun too. Do I think the world will end on December 21st 2012 after seeing this? I honestly can't say, but at least I know John Cusack will save everyone's lives.